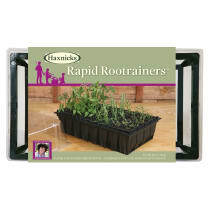 Used by commercial growers and recommended by professionals, Haxnicks Rootrainers have become an indispensable propagating system for gardening enthusiasts worldwide. 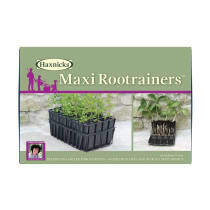 The secret of Rootrainers' success - better roots mean better plants every time. 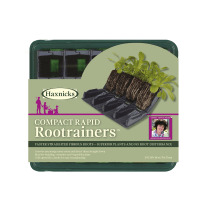 The first roots race down the special grooves and quickly emerge through the drainage holes. The tips die off naturally causing masses of side roots to develop higher in the cell. 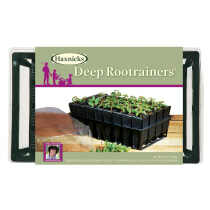 This results in a super root system all set to feed the perfect plant. This process of 'air pruning' encourages vigorous and strong root formation; roots grow straight, avoiding root balls and pot bound plants. 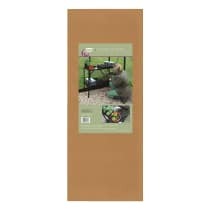 Rootrainers provide the perfect start for all seeds, seedlings, plugs & cuttings, especially those that require deep root runs and those that are sensitive to root disturbance.